Notes: Turner A12. "One of four cairns 310 metres south of Horn's Cross forming part of a cairn cemetery on Holne Ridge. Ring cairn measuring 19.9 metres in diameter, height 0.9 metres. Has a 4 metre wide bank standing up to 0.9 metres high surrounding an 11.9 metre diameter internal area. A stone on the inner face of the east side of the cairn has been cut by tear and feather." Notes: "One or two cairns and a short probably unfinished stone row lie in the north west facing hollow above Horse Ford on the O Brook. The cairn described by Authority 2 lies at the south end of the site with the surviving stones of the stone row to the north. As so few stones survive the exact form and extent of the rows is impossible to determine but there may have been as many as three parallel rows approximately 1.0 metre apart. Overlying or abutting the east row at SX 6672 7109 is a low turf covered mound 3.0 metes in diameter and 0.4 metres high. 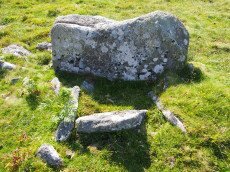 It is not clear whether this feature forms part of the monument or if it is associated with the shallow turf cuttings to the east." Notes: Turner A35. 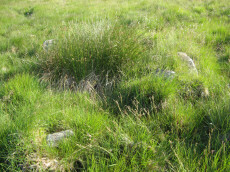 "Remains of cairn; one of eight cairns forming part of a cairn cemetery on Holne Ridge. Truncated cairn, or ring cairn, gap in north-east. Diameter 14 metres, height 0.3 metres." Notes: The Sherberton double row was discovered in 1997. It is an unimpressive double row of small stones a short distance north-west of the Sherberton Circle. For a plan see Butler Vol. 5 p. 210-12. Lethbridge pp.99-100, diagram p.99 and p.100. Notes: Remains of a 97 ft diameter stone circle with a stone wall passing through its western side. "Nine of the original stones are still standing, plus one larger stone which is incorporated in the remains of the old wall which bisects the western extremity of the circle. This stone appears to have been removed from the original circumference, and its height is 1.4m. The remaining nine stones range in height from 0.3m to 0.75m. The original circle appears to have been c. 30m across, although no stones appear to the west of the old wall. The length of the 2 fallen stones at the southern end is 2.6m and 2.4m". 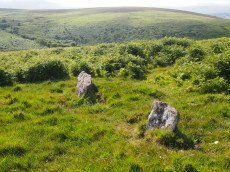 For a photo of this site, see: Megalithic Portal: Sherberton circle. Lethbridge p.101, diagram p.99 and p.100. Notes: Turner D18. Dixon #18. Bar Rep. 24. Butler Vol. 4. Map 61.8 (diagram p.203). Grinsell LYDFORD 102. 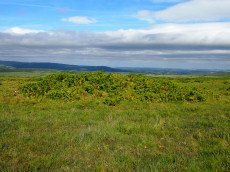 "A Bronze Age cairn containing a cist located on the north east facing slope of Skir Hill 590 metres south of Skir Ford. The cairn survives as a 4.1 diameter ring of edge set slabs up to 0.5 metres high. The cist is situated slightly west of the cairns centre and survives as a 0.82 metres long by 0.52 metres wide and 0.82 metres deep stone lined pit." Formerly listed as being at SX 6517 7075 (as per literature). Dave Martin reports it is actually located at SX 65092 70684. 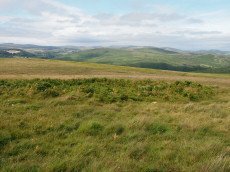 The author has found this site at SX 65104 70691 on 28/06/18 assisted by the grid reference given by Dave Martin.